After saving up enough money to eventually quit her job as a copywriter, Janice MacLeod travels to Europe for a few weeks to rediscover herself and figure out what she wants to do with her life. Although she’s always had an interest in art, she somehow fell into the world of corporate advertising. The worst kind too, she’s responsible for all that junk mail that arrives in your junk mail. 3 days into her stay in Paris, she eyes the handsome butcher across the street from a cafe she frequents. After being nudged by a friend to speak to this butcher, things in her life start to finally fall into place. The weeks turn into months then turn into years. Along the way, she reignited her artistic drive. 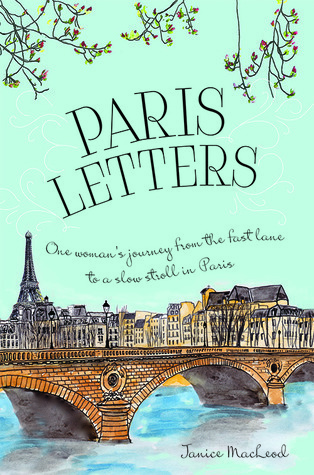 She’s the founder of the Etsy shop Paris Letters. When you sign up for a subscription (1, 6, or 12 months), she will mail you a hand painted personalized letter from Paris. The book is a quick read, and I, like many others, am so jealous of her journey. It was interesting witnessing her relationship develop with the butcher, when neither of them could speak the same language for the beginning of their time together. He didn’t speak English, and she didn’t speak much French or Polish. Paris is a beautiful city with so much history. This is another good memoir for Francophiles to add to their shelves.